LB Sio Moore is a ball of energy. 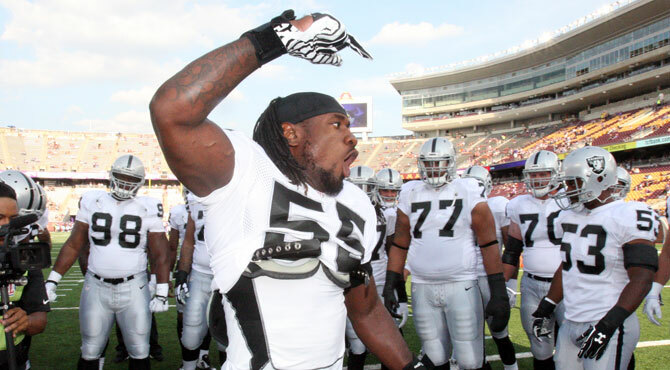 Raider Nation has seen that energy on full display at O.co Coliseum. He is a passionate person on and off the field. He has taken those lessons to football. When Moore moved to North Carolina, he wanted to be on the field with his friends. He was challenged on a daily basis by more experienced kids. But Moore didn’t want to be second string or third string; he wanted to be first. “That was the first time it kind of lit my fire to really try and do something with ball,” he said. The second time was in college when he was up against a top offensive line prospect. “One day he blocked me and he was going in talking about how good he was and how bad I was and that was the first time it lit a fire that nobody was going to tell me what I can and cannot do on this field. I haven’t lost it since,” said Moore. As Moore works to be the best person he can be outside of football, he’s seeing it translate to the field. And understanding who he is, what’s important, and how to conduct himself has given him an even greater love for football.